Set menus seem to be the in thing these days with many fine dines offering a range of such menus. The main advantages of set menus are that they spare the indecisive customer from a decision conundrum of what to order, whereas for the inquisitive ones it gives a chance to taste some of the special dishes of the restaurant at an economical price. 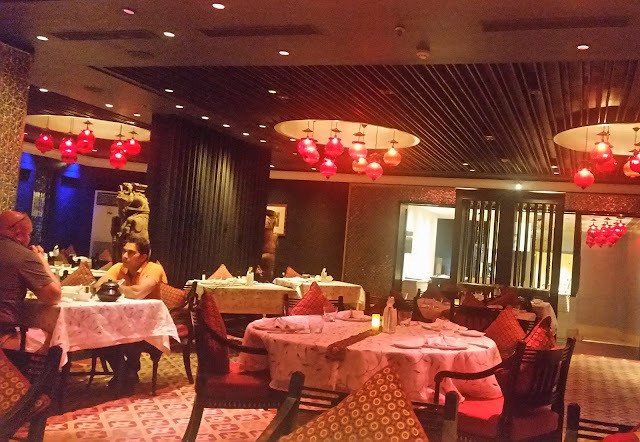 Bidri at Marriott Hyderabad prides itself on serving royal and riyasati food. 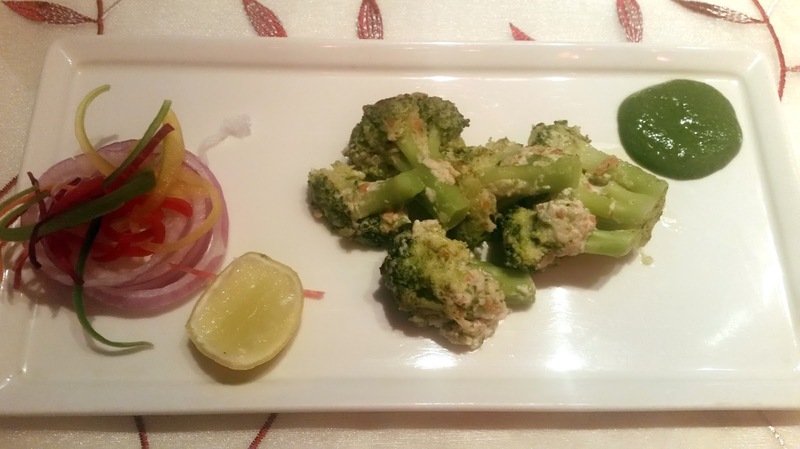 The restaurant has launched a new range of set menus with elaborate offerings for vegetarians, non-vegetarians and seafood lovers. The highlights of these completely Indian variants are unlimited kababs, main courses and plated desserts. The team at Bidri has made sure that regular customers get to try a variety by changing the menu items every day. Also, they have a mix of authentic recipes as well as a few experimental ones to appeal to the guest’s palate. Invited to try out the menu on a Friday night, I settled down with a soup called Gosht Ka Arak, a lamb soup of medium consistency which retained the flavour of the meat. 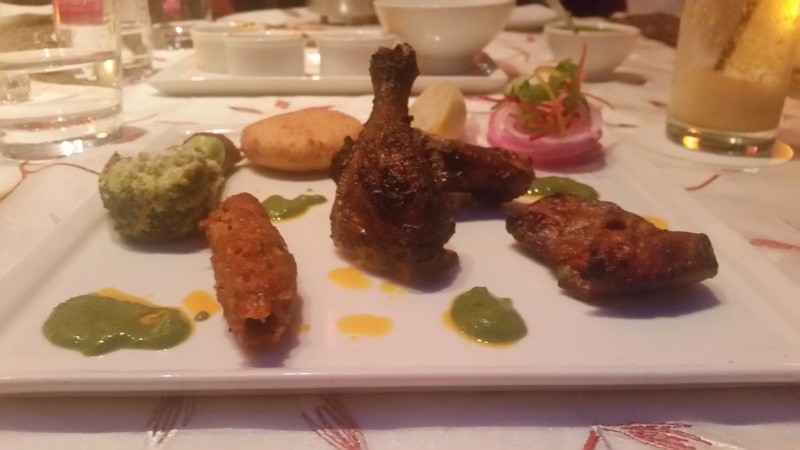 This was followed by a platter of starters – which had quite a few uncommon ones designed by the chefs here. Executive Chef Yogendar Pal explained that some hard research had gone into curating some of the items on the menu. An example of this was the vegetarian Arbi aur Moongphali ki Seekh. Arbi or colocasia is a popular vegetable in the hilly terrains of North India, and here was spiced and mash with peanut pieces prepared on a skewer. Tandoori Malai Broccoli was another of the gourmet vegetarian starters, where broccolis infused with cheddar and cream result in a delicious tandoori concoction. The Bharwan Dahi Kabab was delightful with a very thin layer of semolina on top instead of the usual crust which is a lot thicker. Among the non-vegetarian options my pick was Bhatti Ka Murgh, where chicken pieces have been marinated overnight in specific spices and water, before finishing it up on a sigree. The spices had really permeated the chicken, and the aftertaste of pepper hits you as you slowly dig into it. This was my pick for the day. Badami Lamb Seekh and Pakke Boti Ki Kabab were the other starters. Between the starters and the main courses, we were served a refreshing sorbet called Sambuca and Yoghurt Granita with a distinct flavour of fennel seeds. The main courses were as interesting as the starters. There were clearly two streams – one consisting of home recipes and another with more elaborate rich stuff. 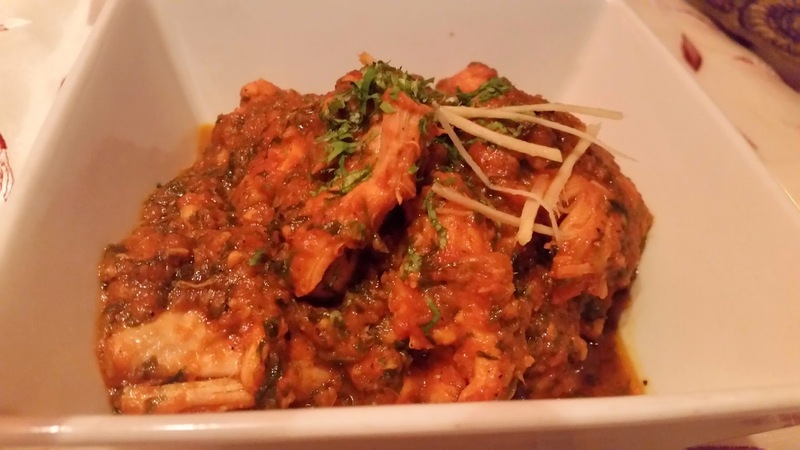 Rajpure Ka Tomato Chicken was a recipe inspired by an aunt of Chef Yogender. The recipe uses no onions, and is cooked in a simple way with select sweet tomatoes and a little bit of leafy vegetables. Ma Ka Daal was a homely urad dal preparation which was absolutely soul food. The Baigan Bhartha here was a preparation quite different from the ones I had earlier, done up with a liberal amount of peas. Among the more rich preparations, Raarhi Bateir, a masala preparation of quail impressed me a lot. The thick masala in it was a perfect combination with the fermented Khameeri Rotis. There were other assorted bread varieties of which a coin sized paratha preparation stood out. 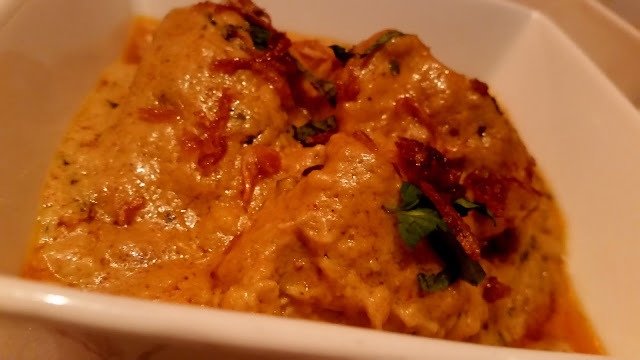 The other main courses served were Malai Paneer, Nawabi Kofte; Dum Ka Machhi a cashew and yoghurt based fish gravy was of course preferred by this biased Bengali. 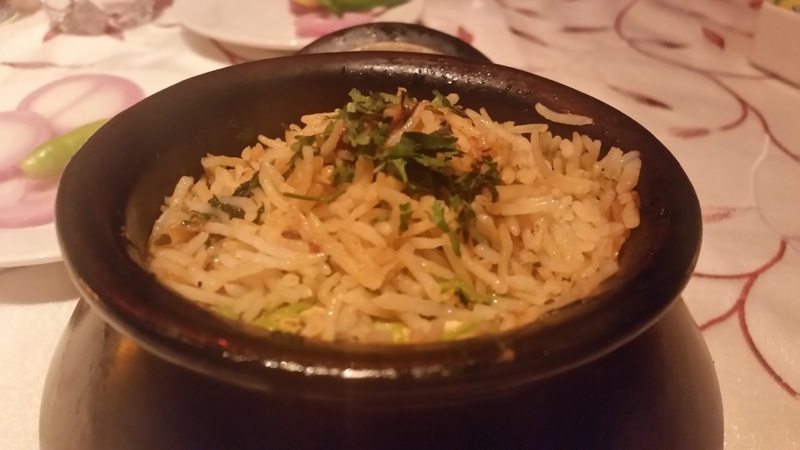 The rice dish we tried was called the Tawa Meat Pulao. 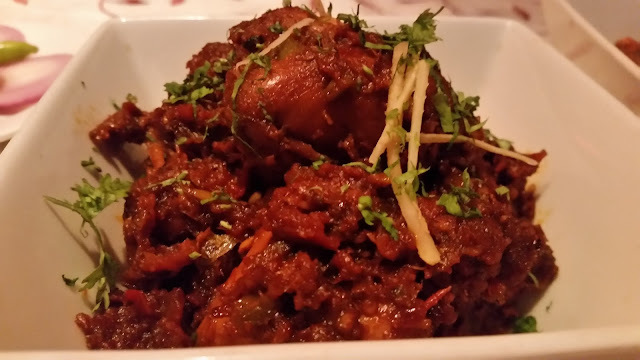 The masala in the rice with extremely flavourful and the meat well cooked. Had I not been too full, I would have gone for a second helping of this. Finally, it was time for desserts and this was again one area where Bidri impressed a lot, both in presentation and content. 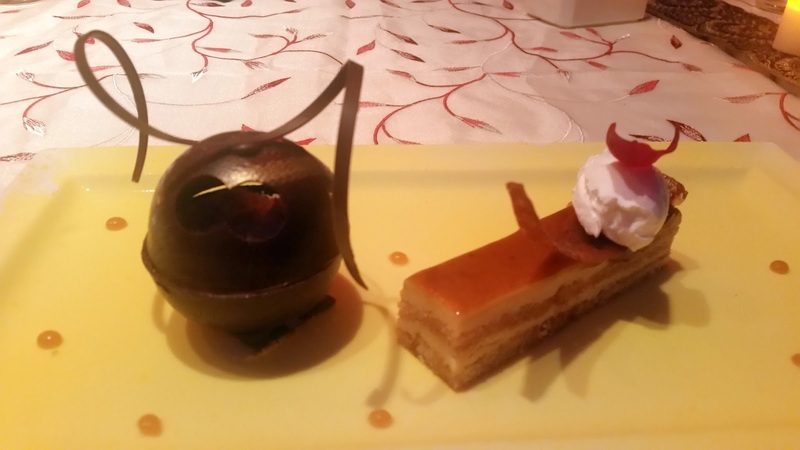 Chocolate Khubani had khubani ka meetha with a light mousse inside a chocolate shell. The styling was brilliant here. The contemporary take on Double Ka Meetha was a dish called the Mille Feuille, with layers of khoya and bread topped with caramel. The mastery in preparing both the desserts reminded me of the Sheermal Pudding which I tasted here a few months back at the same place. Thus, the sumptuous set dinner came to an end. 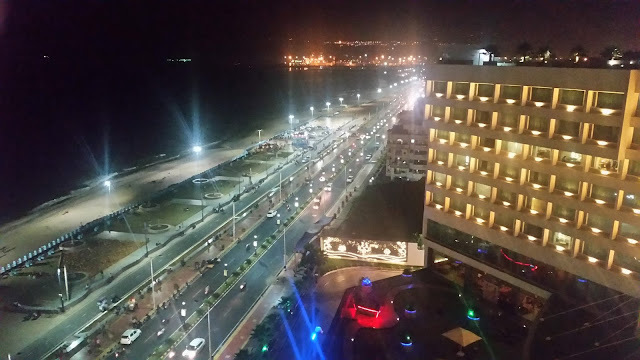 The restaurant has three variants of the set menu – vegetarian (Rs 1500+), non-vegetarian (Rs 1700+) and seafood (Rs 1800+). Please note that the items I had may not be available on a given day as they have a rotating menu. But trust Chef Yogender and his team to dish out stuff which will be equally brilliant. Will surely try Bidri dear next time I am in hyderabd , thanks to yr review.